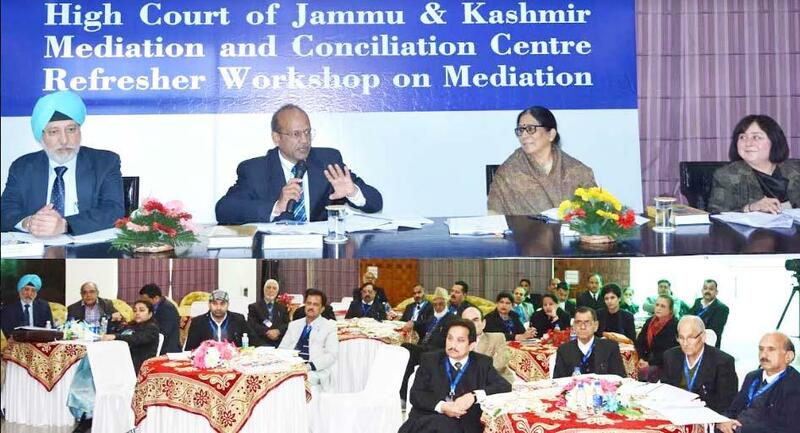 JAMMU, FEBRUARY 9: The second day of the 3-Day Refresher Workshop on Mediation for Lawyers, organized by the Mediation and Conciliation Committee of the High Court in collaboration with Jammu and Kashmir Government, today witnessed consensus over Mediation to be evolved as an effective tool towards dispute resolution in all its manifestations. During brain storming sessions and deliberations the speakers and the participants called besides creation and evaluation of options for making Mediation important ingredient of speedy justice delivery. The day recorded four sessions which were chaired by Justice Sindhu Sharma, Justice, Rajesh Bindal, Justice Sanjay Kumar Gupta and Justice Tashi Rabstan respectively. The topics covered included Advanced Negotiation Concepts including performative, distributive, integrative and transformative, seven elements of negotiation, barriers to negotiation, bargaining, Understanding Communication, Maintaining Neutrality, Principles and skills, Asking the right questions, Summarizing, reframing and reflecting, Mediation; process and stages including introduction and opening statement, joint session, separate session and gathering information besides Role of the parties, role of the lawyers and role of the mediator and Role play. The eminent resource persons explained elaborately that how Mediation has emerged as a fast growing disputes redressal mechanism for settlement of disputes in an amicable way which is the hall-mark of civilization. The goal of mediation is to find a mutually acceptable solution that adequately and legitimately satisfies the needs, desires and interests of the parties, they added. They further said that Mediation provides an efficient, effective, speedy, convenient and less expensive process to resolve a dispute with dignity, mutual respect and civility. The speakers expressed hope that the trained Mediator will employ specialized communication skills and negotiation techniques, gained through such workshops, to facilitate a productive interaction between the parties so that they are able to overcome negotiation impasses and find mutually acceptable solutions. They were optimistic that the event will facilitate and help guide mediation in growing not as an alternative dispute resolution mechanism, but as another effective mode of disputes resolution. The workshop also focused on several significant issues and subjects like role of mediator in removing obstacles in communication, qualities of a Mediator including complete faith in the process of mediation and its efficacy, ability and commitment to strive for excellence in the art of mediation by constantly updating skills and knowledge, sensitivity, alertness and ability to perceive, appreciate and respect the needs, interests, aspirations, emotions, sentiments, and mindset of the parties, highest standards of honesty and integrity in conduct and behavior, neutrality, objectivity and non-judgmental, ability to be an attentive, active and patient listener, persistence and perseverance, good communication skills, open mindedness and flexibility, empathy and creativity. The eminent speakers, while addressing the sessions, elaborated on several other issues like questions must be relevant and appropriate as questioning is a tool which should be used with discretion and sensitivity, effective communication aimed at reaching an agreement between the parties to the dispute, helping the parties to arrive at an agreement which is as satisfactory as possible to both the parties etc. The Resource persons of national and international repute for today’s sessions were J.P. Singh, Sudhanshu Batra, Sadhana Ramachandran, Veena Ralli, Amita Sehgal and Anuj Aggarwal.